Alongside their SD 7.1 specification, the SD Association has revealed its MicroSD Express standard, upgrading the humble SD card with PCIe connectivity and NVMe as its upper layer protocol. In short, the performance if NVMe SSDs is coming to the world of MicroSD cards, while also offering backwards compatibility with older standards like SD and SD-UHS104. 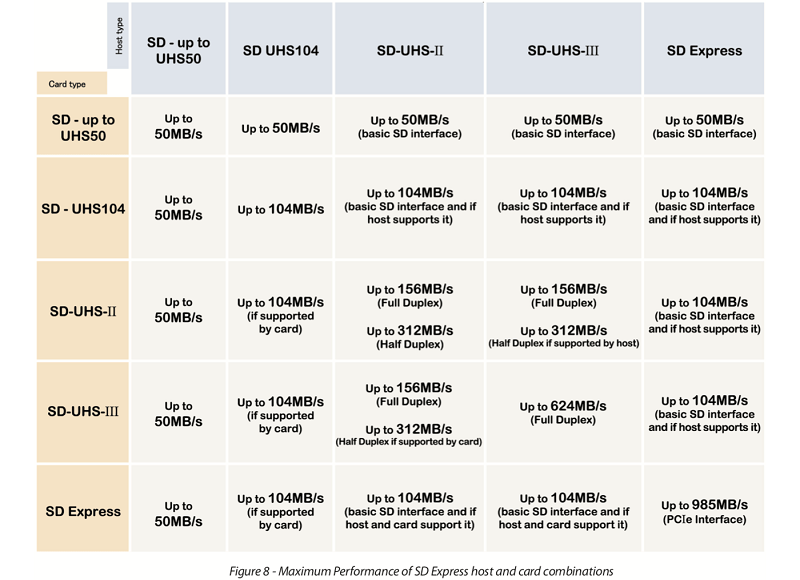 What changes with MicroSD Express is that the second row of pins from UHS-II cards is repurposed to support PCIe 3.0 x1 connections, with the new standard utilising the NVMe protocol to offer transfer speeds of up to 985MB/s. This change will allow future SD cards to provide transfer speeds that surpass SATA Solid State Drives, which is an amazing feat given the small form factor of MicroSD cards. In effect, this breaks backwards compatibility with UHS-II and UHS-III devices, though UHS speeds of up to 104MB/s can still be utilised. With MicroSD Express, speeds of up to 985MB/s are possible, which is great news for future high-performance mobile devices. Support for NMVe 1.3 also adds several SSD-like specifications to the SD Express standard, like bus mastering, multi-queue, host memory buffer and several other enhancements while maintaining backwards compatibility with SD UHS104 and lower standards. Because of the SD Associations repurposing of UHS-II pins with SD Express, the standard is not backwards compatible with either UHS-II or UHS-III speeds, preventing UHS-II/III cards from accessing their full speeds on SD Express hosts and SD Express cards from saturating UHS-II/III hosts, reverting to UHS104 speeds. A full chart which showcases backwards compatibility is available below. PCIe Specification conformance tests are available today for SD Express, thanks to a collaboration between PSI-SIG and the SD Association. While transfer speeds of 985MB/s seem excessive for a MicroSD card, it is encouraging to see compact storage solutions offer more SSD-like features and increased transfer speeds, especially in an era where 8K video recording is becoming more popular and high-resolution/framerate video is becoming recordable on today's smartphones and drones. This new standard will provide additional competition in the high-end video production market, though SD Express will also be usable for future mobile computing platforms, games consoles, automotive applications and a wide range of other applications. You can join the discussion on the SD Association's MicroSD Express standard and it's 985MB/s transfer speeds on the OC3D Forums. 985mb/s isn't that excessive when you consider that a few manufacturers (at least Lexar and Sandisk) have released 1TB SDcards. With a 95mb/s read speed, it would take you just under 3 hours to read the whole thing. With a 985mb/s read speed, it will only take you 17 minutes to read the whole card. Yes, but how often will you read the whole thing? Pushing past the peak performance of SATA SSDs is still an insane feat on MicroSD. While I doubt any early MicroSD Express cards will saturate the 1x PCIe 3.0 lane, it is a pretty incredible feat for most applications. Need to transfer 1GB of images from your camera? Have fast load times on a Next-Gen Nintendo Switch etc etc. 985MB/s is still pretty darn insane for that. Basically, Video Recording will use that, also high speed photography. Right now if you're a pro photographer with a high resolution, high speed camera like the Sony A9 the camera will actually record into 2 SD cards, much like RAID 0, but not quite, to achieve the kind of performance levels needed, and will still slow down after some shots, (also cameras like this usually have a massive internal buffer that takes a long time to offload to the SD card after a long sequence of shots, redering the photograper unable to shoot again untill the buffer is emptied). Also high resolution videography already uses SSD's, as SD Cards just can't be fast enough for high resolution, high framerate video recording, but this comes at the cost of space and some other inconveniences. Nowadays a lot of videographers prefer to output their videos from their camera to an external video recording device via HDMI or DP, to avoid the trouble with internal storage and compatibility between different camera models and manufacturers. This is a very much welcomed improvement to the SD card standard as it will surely speed things up, especially considering that since there is no mention of full size SD cards here, I'd guess they'll be releasing an even faster standard for full sized SD Cards which will also be very much welcomed by anyone who do videography or sports/events photography.